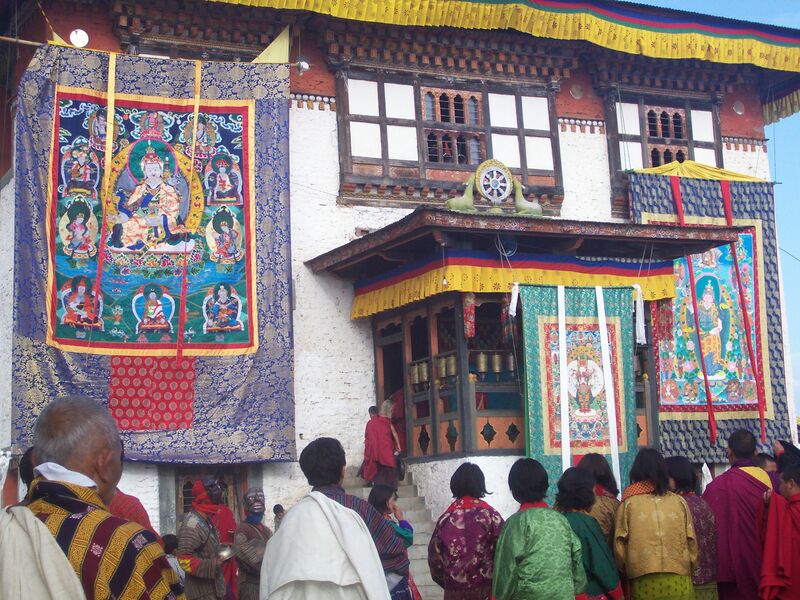 © 2008 Melanie Bell | Sacred scrolls at a tsechu (festival) portray the beloved Bhutanese saint Guru Rinpoche. They are only displayed once a year. Cha du chab dil, cheb cheb cheb. Sem di se gay, shor shor shor. Apa nga lu ma da. Ayi nga lu ma da, na yi pe che shey shey. “What does it mean?” Larissa wants to know. “Rain is falling, cheb cheb cheb. Cheb cheb cheb is the sound of the rain. Children are playing, shor shor shor. That’s the sound of them playing. Mother, don’t beat me. I know everything. “That’s cool,” says Larissa with her gentle ever-present smile, and we two Canadians try to remember the words. Sonam’s easy laugh bells out at our attempts. “Can you sing it again?” Larissa asks, and Choeden resumes the tune. I join her on cheb cheb cheb and shor shor shor, chiming in where I think I remember, tapering off where I realize I don’t. On the fourth try, Larissa has about half of it down and I have most of it. “Do you have any songs like that?” Choeden asks us. And he couldn’t get up ‘til the morning. “We say ‘couldn’t get up in the morning’,” says Larissa. “Old man is snor-ing!” Choeden laughs so hard the tune is smothered. Songs spice our climb and the rain begins in earnest. Weather is sudden here, from clear horizon to pelt of wet hailstones. Larissa wraps herself in her jacket. Choeden pulls us to her unthinkingly, linking hands like sisters. All the way to the restaurant, she is laughing at a single line. We puddle onto Mountain’s thick wooden benches. I examine my hair, which has curled to strings of almost black, almost like Choeden’s. We’ve changed out of our school kiras so no silk is wet. Larissa is sensibly in capris, Choeden in jeans, and I’m in the knee-length flowered skirt that brings comments of “What are you wearing a skirt for?” In everything else, the students call me cool (jigs! ): in baggy pants, in kira, when singing. Choeden orders those ubiquitous cabbage dumplings called momos for us all. An eight-year-old girl, teddy-faced in her pink sweat suit, brings us plates. Oh you cannot tie the kira we will dress you you cannot take pepper no one else takes water keep legs crossed for prayer the statues stare so hard I slow my talk enunciate shift my expressions from gonna to going to learn to shower with cold bucket water watch beetles crawl on walls and birds fly in and out windows it is like that only. My roommate Metho, who runs mouse-like with worry over assignments and committees and seldom has time for noodles, is the slightest twenty-one-year-old I have met. Each meal, at packed square mess hall tables with their communal pots, she eats a single serving from a wooden bowl smaller than the other girls’ plastic dishes that are printed with Noddy and Pokémon, cartoons they’ve never watched. I take heaping servings and try to shovel the sour sear of curry-sopping, potato-cabbage-and-mostly-chili-covered rice into my mouth. On good days, the dogs hanging round the mess hall, their bodies raw with sores, only get a quarter of what was on my plate. We’re standing by a tree with peeling, graying paper bark with a name I can’t remember. She teaches me the Dzongkha word for tree: shing. She says it is almost the same as the word in Sharchhop, the dialect spoken here in the east, where the college is located. I think shi now but memory is fickle. We flop in the grass, which has a name I also forget. Another night, she asks if there is a way in Canada to make yourself taller. Yes, I’ve heard of that one too. They break your bones and put them back together, so you gain maybe a couple inches and your leg function isn’t always restored. Oh you want to wash your dishes we thought you’d be like the American students I have three boyfriends if my mother found out she would be beating me black and blue I love one of them but his mother arranged a marriage with an in-law I have a boyfriend and don’t like him I never answer when he calls if I keep him hanging he will think I am just busy he will have hope. “I like being alone.” I feel disloyal and grateful. Sanggay strides from the room and I follow. She proceeds to take me for a butter tea called seuja and momos. I dab as much chili sauce on them as Sanggay. After, she orders me on a walk. “Eh Sanggay!” calls out a student on the road. We walk the same path, the clouds dingy but unraining. “I hate it here,” she says. “The weather is always gray.” We stop at a flat rock to sit. Sanggay plays music on her cell phone—Shania Twain. We look down at what the clouds and path hang over: plunges of green mountains terraced with farmland, white little villages, pines. The soundtrack doesn’t fit the scene. “I think it’s beautiful here,” I breathe. “I can’t wait to move to the city,” Sanggay says. We get up, resume walking, and talk about our families. Her mother died when she was young, so her mother’s parents matched up her father with her maternal aunt. “He didn’t want to marry her. She wasn’t beautiful. He found another woman who was beautiful and left my aunt, but his parents wouldn’t let him be with the woman, and he had to come back and pay his first wife 5,000 Nu.” This fine is imposed by the new Constitution, she says, if a husband leaves his wife or marries another woman without her consent. There are birds in the sky with names I don’t know—electric blue zinging over the valley, zebra-striped above the small house that doubles as a public lending library. A few more students pass us in the freedom of casual clothes outside of class. Sanggay’s hair is long, her look (as she boasts) fashionable, her eyes serious. I try to apologize without knowing how. At some point in our talk my parents’ separation comes up, my dad’s inability to find a job, and I blink back a windshield of tears as Sanggay asks why I don’t send him money. I just ask where wealth comes from in Bhutan, this tiny nation. She explains how it’s a product of the landlord’s role in the feudal system. This, I know, was abolished by the King a mere generation ago. “Have you ever wondered?” I didn’t think I believed in reincarnation, but hearing the story of Sanggay’s sunray-traveling uncle among the clear mountains, I cannot disbelieve. “When I was young I had an English friend I always used to play with, and I have always liked English things. So I think I am maybe the reincarnation of an English person!” she laughs. My father left my mother he was a philanderer but he is a good man I wanted to die they got back together I am happy I am connected to all through the wires of love it’s not like in your college you have to spoon feed them they don’t know how to take down the main points do you think love brings peace I think it doesn’t. In Bhutan, going for a walk is going on a date, and yes, it is a walk. Choeden had set me up with a friend but he stayed home, so she shows up with another. Bhim has a girlfriend back home: safe. “Sing something for him,” Choeden coaxes. I sing what she taught me, a Dzongkha pop ballad about my flying heart. “I like to sing too, but I can’t sing,” says Bhim. He waves his arms and breaks into song, vigorously and out of tune. He grins too eagerly at me. I think, it’s only a walk. “I can’t sing either,” I say, “just for fun.” It is for novelty’s sake that the Bhutanese get me to sing, not for flawless intonation. “You and Larissa can sing at the talent show,” Choeden declares, something that will never happen. Instead I will sing for audiences of students at the hostel, in the restaurant, at the thank you dinner for students in the Save the Children show that my roommates performed in, and I will lap up the clapping like I lapped Sanggay’s attention. We walk together to Bhim’s sister’s house uptown. She lives in an apartment with a ramshackle wooden balcony. There is a prayer wheel on the porch, miniature and gilded. The husband, Bhim’s in-law, opens the door and we step into a white-walled space with posters of European cottages in the snow, all with slogans about happiness, and crocheted things thrown over the sofas. It isn’t so different from the home of an elderly woman friend my family used to visit. Bhim’s smiling sister is as broad as Metho is slight. I ask her name. “You can call her Didi,” says Bhim. “It means auntie in Nepali.” She beams when I call her that. Two serious-faced girls trail behind and offer tea, and there’s a little monkey son whose earnest demeanor can’t mask his impishness. Behind the house is the neighbor’s farm, a few acres of sheer green against a landscape in startling shades of the same color. We watch a sappy Dzongkha drama on TV and chat, the son at our feet, while Didi cooks dinner. Like everything homemade here, it’s a feast—perfect granules of rice, salty dishes of potato curries, fritters, spinach, curdled cream. “Can you teach me to cook something Nepali?” I ask Didi. Bhim translates and she agrees, so we set a date for cooking lessons. I borrowed your sandals can you tell me what is a coral reef how do I formally address an ambassador in English I don’t like to cook my mother wants me to cook the great lesson is to realize that all the levels of life are a joke and to be able to laugh at them we seek changes we think are better than our present situation and take the suffering that comes from them to be pleasure. Choeden walks with Bhim and me and spins the prayer wheel on the porch. Didi shows me how to make two deep-fried, battered snacks called pejey with potatoes and chili chops, with Bhutan’s constant green chilies. I write down the instructions in my notebook, surprising my friends who seldom take notes out of class. Didi won’t let me touch anything. “But how can I learn if I don’t do it?” She starts shelling peas into a vast silver bowl. I kneel on the floor and join her. I write in my notebook, “Shell about half a bowl of peas,” but they turn out to be for a supper curry instead. I cross out the line. A knock on the door signals two of Didi’s women friends. They come to sit cross-legged in the kitchen, chatter in Nepali, and munch the things she has just fried. The plates end up in the middle of the floor with all of us grabbing at will. Choeden and Bhim start talking in Nepali as well. Bored, I watch the little son, Amita, and start to sketch him. “But he has a girlfriend,” I protest. Choeden takes the piece of paper I’ve written the recipes on and outlines a face. The angles of its fat cheeks and dimple lines make it look peeved. “It doesn’t look like you,” she laughs. Angry Malanie, she scrawls above the head. The women have noticed my own sketching and lean in to watch. I finish the drawing, sign it, and try to write something nice and legible on the back for little Amita to keep. The women chuckle to each other appreciatively. Didi speaks and Bhim translates: she wants me to come again. She will make shel-roti, a traditional Nepali bread he has spoken of, eaten on special occasions. I have not heard anyone in Bhim’s family speak English. During our next and final visit, Bhim and Amita walk up to me. “He has something to tell you,” says Bhim. Amita looks directly at me, dark eyes earnest. His words run together in a monotone. “It was great meeting you I wish you the best of luck in life Tashi delek from Melanie.” He has memorized the message I scribbled on the back of his portrait. Teen pregnancy will ruin your life uneducated people especially want to watch the movies so they can learn things we respect the pillow when we don’t have a picture of the gods we kneel down and pray on the pillow in my grandfather’s time there was only one river it split into two because there was a competition I don’t know if there was a prize or what but the other river got ahead and when this one found out it got angry. Pema gives me a tiny bowl of reddish wood and ties a string of gemstone beads around my neck, two orange, one patterned brown, for festival days. I give my shell necklace to Pema, along with a pair of pants that fit her better than me, and a painting I did of the Bhutanese King. I hand Choeden a conch shell necklace and earrings. Sanggay passes me a woven bag and lets me keep a book about a foreigner who taught here and fell in love. I ask her to pick out a pair of earrings and she chooses black and white ones that dangle tiny hearts. Metho gives me a pair of jeans that fit me better than her and two toegos, one black and plain, one green with tiny flowers. “It is like you are part of my family now.” I give her a portrait I drew of her, an oversize green shirt she really likes, and my favorite black sweater that no one knows is my favorite, the one with a tiny cat logo that stands mid-stride. I tell her it is like she’s part of mine. Do you miss your family in North America everyone’s dressed like sluts in a few weeks they’ll look normal again a song from Dzongkha lessons Druk ki gyelkhab ga me ga druk ki gyelkhab ke me ke Bhutan is a beautiful country Bhutan is a peaceful country I don’t think love brings peace either Metho. I walk for the last time past the base of the raised football field where monks gather to watch and notice weeds poking horizontally from the crumbled stone sides. I try on the pale green toego that was pressed into my hands. The fabric is so smooth and glowing slightly. Wearing silk every day to class is something I will miss. But I will wear this toego to a friend’s house, to a conference in the rain, wear it walking to class with hair in a knot and huge hoop earrings while kicking Canadian leaves, listening to them rustle cheb cheb cheb. Melanie Bell had the good fortune of spending the summer of 2008 in Bhutan, in the wake of the country’s first democratic election. A native of Prince Edward Island, Canada who now lives in San Francisco, her writing has appeared in various publications including the Fiddlehead, CV2, Grain, and the Island Review. 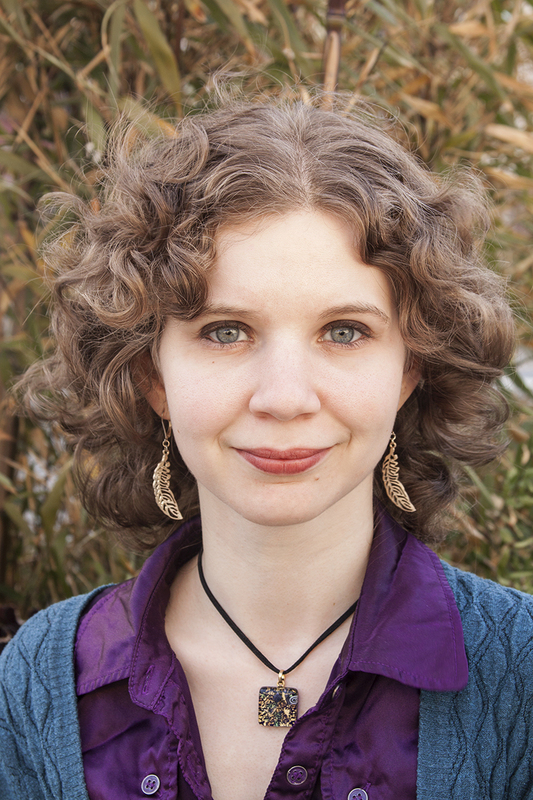 She holds an MA in creative writing from Concordia University in Montreal. She teaches about Enneagram personality types through Berghoef & Bell Innovations.